With Orion, we have signed our first Finnish artist on Trapez and with that take another bite out of dark raw techno which is on the go world wide.Orion aka Juska Wendland is known in his home country for his decade long work for Finnish National Radio YleX. There he hosts a program every Friday night. 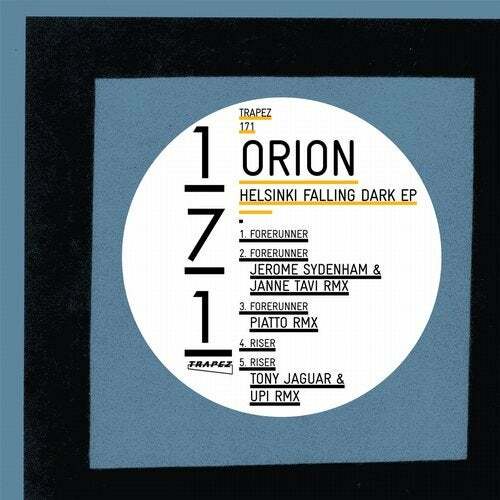 He produces techno as a solo artist and orchestral chill-out music as one half of the Orion & J.Shore duo.His "Helsinki Falling Dark" EP starts with the original version of "Forerunner" which shows a sound metamorphosis in a post Detroit Techno characteristic. Futuristic sounding sequences slowly blend from one into the next expressing that kind of an urgency and claustrophobia which works so well on dark intimate dance floors.Jerome Sydenham needs no introduction here. He has recorded a remix of "Forerunner" together with Finnish artists Janne Tavi.Their remix goes well with the hard and pounding techno Jerome has released in recent years on labels such as Drumcode and Ibadan.The second "Forerunner" remix comes from Piatto who has recently released with us on Trapez and who has applied his skill of dealing with deep bass and suspense by repeating and changing a seemingly simple formula into something somehow gigantic. Here he has written a much more polyrythmic complex beat manifesto which will have people dancing like on a vulcano.The original of "Riser" is a machine like track that works skillfully with elements that are added and substrates. It has a strong Detroit touch for all of you who like the like Jeff Mills aura this will be interesting.The remix of "Riser" was written by studio wizard Tony Jaguar who has almost 50 releases under his belt. He has teamed up with Upi who has made his way from the underground techno scene of Helsinki to rocking dance floors in Helsinki and Berlin.Together they create a new school techno sound which is in tune with releases from Paride Saraceni on Trapez.